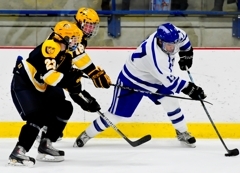 Losing 4-2 in the third period, it looked like St. Thomas Academy would be the victim of a four goal comeback by Breck. That would change in a span of 91 seconds. 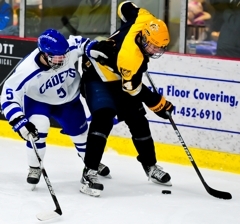 At the 6:47 mark in the third period the Cadets netted 3 straight goals for a comeback of their own as St. Thomas Academy skated to a 5-4 victory over Breck on Saturday, Jan. 22, at St. Thomas Ice Arena. 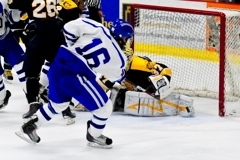 Kroska scored four goals during the action-packed game. Three of them came on the power play. 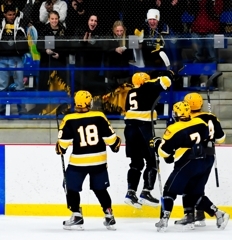 His fourth goal was the game winner. 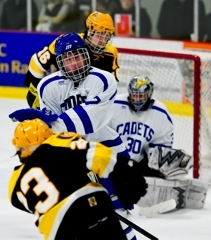 St. Thomas Academy capitalized on all three of its power play chances, with Kroska scoring on each opportunity. 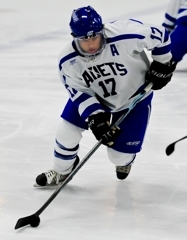 Kroska - who is 5-foot-9, 150 pounds - currently leads the Cadets in power play goals with six and is second in scoring with 24 points (13 goals, 11 assists). “It shows you what heart can do,” Vanelli said. Question: What did you say in the locker room to the team in-between the second and third period? 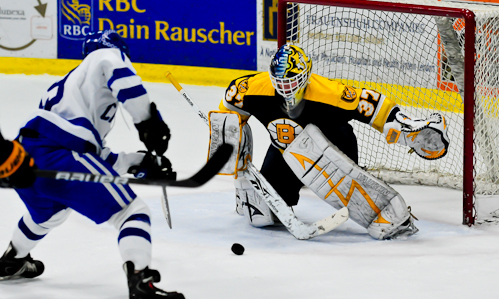 Answer: We just played Shattuck (Tuesday, Jan. 18) and we had a 4-4 game with them and they scored four in the third period on us. So we said to our guys 'you've just seen it done to you so go ahead and do it yourself' and they did. They had a great third period. 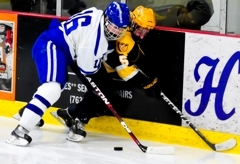 Q: It’s always a great rivalry game between St. Thomas Academy and Breck. 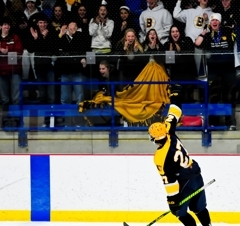 What does a win like this do for the program? A: Obviously we're both up there in the rankings so it gives you some pride. It's in the middle of the season so you can't get too excited about it but it really shows the character we have. 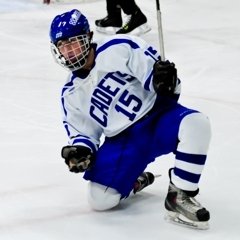 We have Hill-Murray next so we don't have much time to enjoy it. 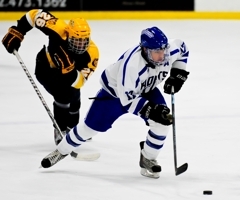 Q: St. Thomas Academy and Hill-Murray also have a very good rivalry too. What’s that game going to be like? A: The last five years it's been us against them for the conference title. 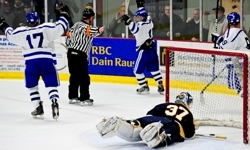 It's always nice and a little, mini goal to get the conference title so it would be nice to get that done. 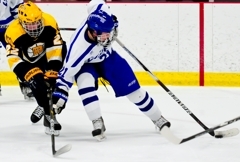 I really respect their team - they have a great program and great coaching. We've had a couple good games against them. 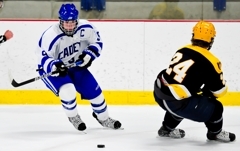 St. Thomas Academy scored three goals in a 1:31-span during the third period to lift the Cadets to a 5-4 victory over Breck on Saturday, Jan. 22, at St. Thomas Ice Arena. 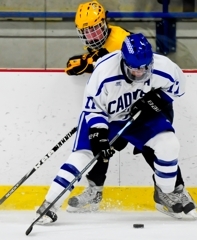 The Cadets' comeback was led by senior forward Matt Kroska who scored four goals in the game - three of those goals coming on the power play with the other being the game-winner. 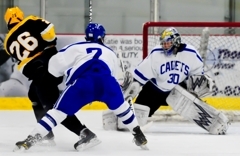 Taylor Fleming had the other goal for the Cadets. 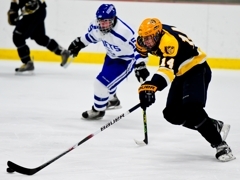 Breck's Wesley Iverson led the scoring for the Mustangs registering two goals and adding one assist. 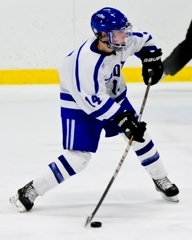 One of Iverson's goals was scored 20 seconds into the third period on a delfection off a St. Thomas Academy defenseman's stick, giving the Mustangs a 4-2 lead. 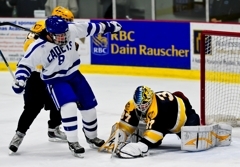 That lead would hold until the 6:47 mark in the third period when the Cadets scored their quick three unanswered goals to win the heated rivalry game. 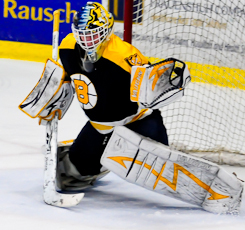 Jake Kenney played stellar in-between the pipes for Breck making 35 saves and keeping St. Thomas Academy's Zach Schroeder (who had multiple breakaway chances) and A.J. 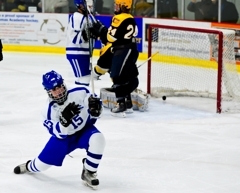 Reid from scoring. 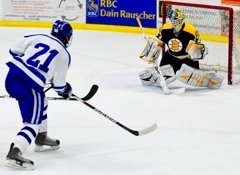 St. Thomas Academy's David Zevnick made 27 saves in the winning effort. 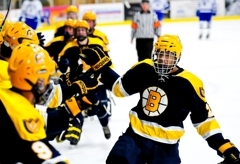 Breck will continue their Class 1A Top Ten play when the Mustangs travel to Totino-Grace on Tuesday, Jan. 25, for a 7 p.m. game. 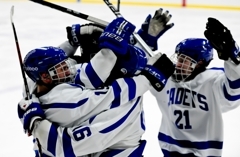 St. Thomas Academy will also be on the road next week when they head to Aldrich Arena to play Hill-Murray on Thursday, Jan. 27, at 8 p.m. The senior forward had a monster day scoring four goals for the Cadets - three of those goals coming on the power play, his other being the game-winner. 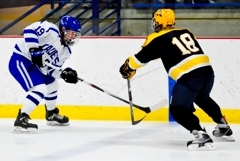 Iverson scored two goals and added one assist powering the Breck offense. 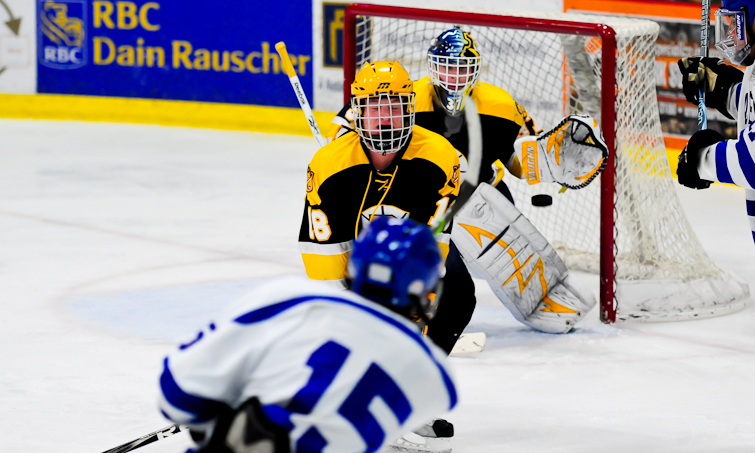 The junior forward's goals were both timely as he sniped the top left corner in the first period 14 seconds after Breck's David Zosel scored. 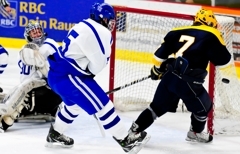 His second goal came 20 seconds into the third period giving the Mustangs a 4-2 lead at the time. 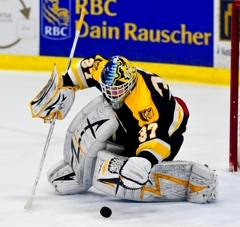 Three of the five goals he surrendered were on the power play and the junior goaltender made 35 saves in the game. 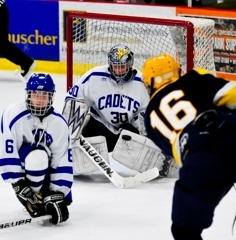 Kenney (pictured below) made several saves on multiple breakaway chances by St. Thomas Academy's Jordan Schroeder.